2019 will be an EPIC celebration of 10 years of ministry with youth in South Carolina and beyond. Revolution 2019 will be held January 25-27 at the historic Township Auditorium. Plans are being made to make this year’s Revolution one that won’t be forgotten anytime soon. And now is the time to become a sponsoring church and reserve your spot to be a part of the fun. 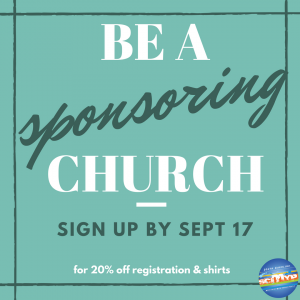 By becoming a sponsoring church, for $225, you will receive 5 registration spots for your church, a 20% discount on both the $55 rate, as well as any pre-ordered event shirts. (Special registration rate and t-shirt price are only available until Friday January 11, 2019). All sponsoring churches will be emailed a discount code in the fall in order to register additional attendees from your group. If you have questions email us at revolution@scmyp.org. To become a sponsoring church click HERE. The deadline to become a sponsoring church and taking advantage of this discount is Monday, September 17th. Sign up TODAY! Be sure to follow @SCMYP on Instagram, Twitter, and Facebook to get the latest news as we have some BIG announcements about some special guests coming in the next few weeks. Is there an address that church sponsorship can be sent to? Yvette, thanks for the message. The best way to register is online. If that doesn’t work for you, please contact us by email with your contact information and church information at revolution@scmyp.org and we will follow up with some instructions.